This might be one of my favorite maternity "outfits" so far. I think it's mostly because this skirt is not-maternity and it just feels so good to be able to get away with it. Thank goodness for elastic waistbands that you can roll down. If you are looking for a striped pencil skirt, I have to say, this one is awesome. It's thick (so no colored underwear shows through), it's soft and oh, it's $10.80. I'm pretty sure I hit the jackpot on this one. In non-clothing related topics, fall is already crazy-busy. Okay, it's not really fall here (97 degrees hardly screams pumpkins) but I work at a university and we are in our third week of classes. Our office already has multiple programs going on, I've had to work late a couple of days and our weekends are filling up. And I'm having a baby in less than three months! I mean, there is a lot going on. I'm already missing the slow pace of summer. Come back, summer. $10.80 clothing jackpot for the win! This outfit is very similar to one I repeatedly put on. Chambray and stripes are so natural together! that skirt is super cute, and for $10 you cant go wrong! love the chambray top as well! I wish summer would come back too! My life was a lot more manageable when I didn't have to worry about working everyday haha. I really like this outfit. I'm pretty sure I have something just like it pinned, and now you are giving me a little boost of motivation to go ahead and wear it! I agree - this outfit is awesome! 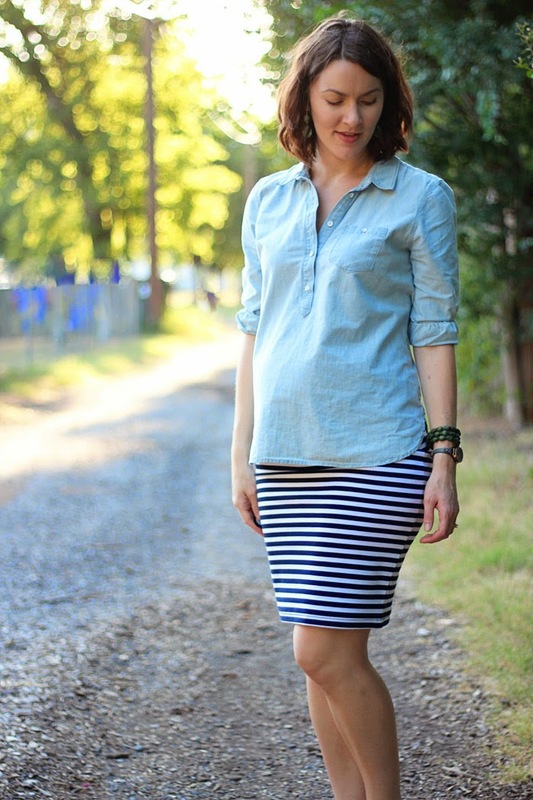 I love pairing chambray with my striped skirt exactly like this! I am tempted to pop in to F21 and see if the navy version is available. I wear my black/white one all the time, so I think navy would be a nice addition! What a deal for the skirt! Love items that you can wear that are non-maternity! You're doing great stretching your wardrobe! I did it! I bought a chambray shirt! Thanks Old Navy for your labor day sale! Stripes and chambray are very cute together. And you can't beat that price for a skirt! Um, yes, you have a TON going on! I'm sure it's not too easy to concentrate when it's 97 outside, especially while pregnant. This combo is so cute together though! Such a great skirt! Yes, it sounds like you have a lot going on. And a new little one on the way very soon... so exciting. I'm a new follower, and your blog is lovely! Foldover skirts and pants are so handy! This is so cute on you! Wow, great find with that skirt!! Ah - I wouldn't want to work in a school right now. The lack of routine and just general craziness of the start to the year is enough to make me run for the hill! 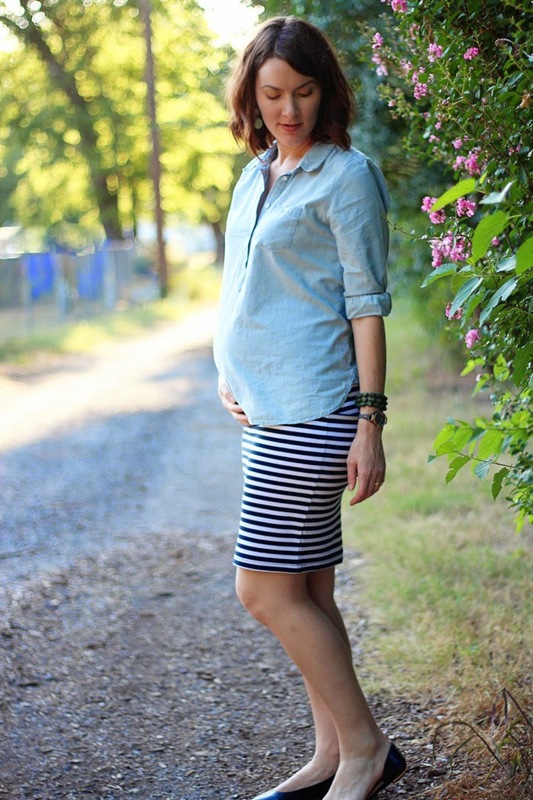 I really love this too - stripes and chambray are a great mix, and not only is the skirt not maternity, but F21. If there was ever a rebellious skirt to be wearing, that would be it. This is one of my favorites you have worn too! 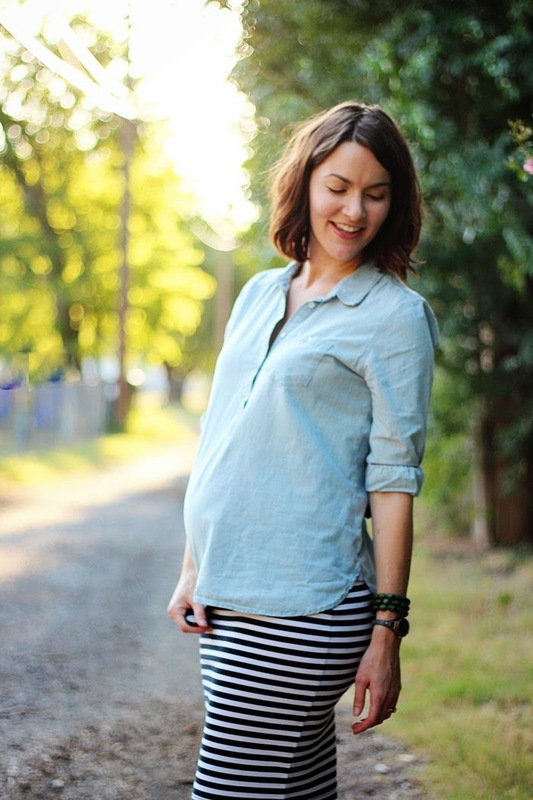 Love the stripes and chambray! Such a great deal on that skirt! I have a similar skirt from Old Navy that I actually do have to roll down-- I could have sized down to fit the waist, but then it would have been too tight on the thighs. Probably shouldn't have bought it, but it was $7 and I get so much use from it! I will definitely be wearing my chambray shirt with my striped skirt once the weather cools down! 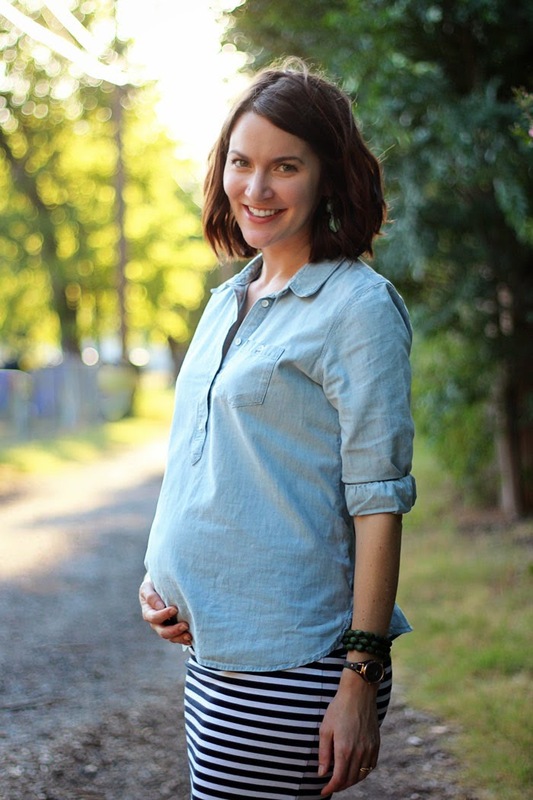 I have been searching for a maternity chambray shirt, and this one is cute! I am going to order it for sure! So glad you are around to model these things in real life! Such a cute outfit...and that skirt, what a deal! Ooo one of my favorite outfits! I love that chambray shirt, it looks so cute with the striped skirt! I totally understand about being busy. I joke that I timed my baby perfectly because I had her in May during the university's slow season. On the downside, it was too hot to take the baby anywhere unless is was early in the morning or late at night. At least the weather will be nice and cool when you have baby! Ok, I have worn a version of this outfit you have on a couple of times before. Love it. Both pieces are awesome. Every woman should own a fitted striped b+w skirt and a lighter-medium wash chambray shirt.